We’d love your help. 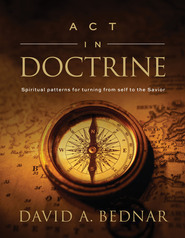 Let us know what’s wrong with this preview of Act in Doctrine by David A. Bednar. To ask other readers questions about Act in Doctrine, please sign up. Wow - wonderful book! Great ideas for how to get better at acting according to our knowledge and testimony. This book doesn't have all the answers - it gives tools for getting all the answers. The book also comes with a DVD that is a recording of Elder Bednar meeting with a small group of people who asked questions about the material in the book. I highly recommend taking time to watch the whole recording after you've read the book! After each of the four chapters, several pages are included tha Wow - wonderful book! Great ideas for how to get better at acting according to our knowledge and testimony. This book doesn't have all the answers - it gives tools for getting all the answers. The book also comes with a DVD that is a recording of Elder Bednar meeting with a small group of people who asked questions about the material in the book. I highly recommend taking time to watch the whole recording after you've read the book! After each of the four chapters, several pages are included that have prompts for more personally applying and learning about the principles. For example - there is a page where you can write scriptures that help teach about the topic, and another page where you can write what you can do to improve and how you will know if you are improving. At the end of each chapter, Elder Bednar also gives information for two additional talks that help teach more about what was discussed in the chapter. I felt like I really grew spiritually as I read this book -- it has caused me to look at different areas of my life and look for ways to ACT! It is good to know something; great to understand it; but it is a completely different level of spirituality to ACT and have experiences which will bring us closer to Christ! Chapter 4 of this book has great advice on how to teach the gospel! This is great timing for me because the whole curriculum for the youth is changing in 2013 -- and is going more to I felt like I really grew spiritually as I read this book -- it has caused me to look at different areas of my life and look for ways to ACT! It is good to know something; great to understand it; but it is a completely different level of spirituality to ACT and have experiences which will bring us closer to Christ! Chapter 4 of this book has great advice on how to teach the gospel! This is great timing for me because the whole curriculum for the youth is changing in 2013 -- and is going more to the format of discussion and inviting them to act... which is exactly what Elder Bednar teaches in Chapter 4! "Jesus, who suffered the most, has the most compassion for all of us who suffer so much less." "The character of Christ is to turn outward in compassion and service when facing spiritual adversity or physical pain even as the natural man in each of us would turn inward in self-obsession and self-interest." "If you and I are focused and frequent in receiving consistent drops of spiritual nourishment, then gospel roots can sink deep into our soul, can become firmly established and grounded, and can produce extraordinary and delicious fruit." "Agency is the fundamental foundation upon which all other gospel doctrines and principles rest." "The fundamental purposes for the gift of agency are to love one another and to choose God." "The pattern of making, remembering, and honoring sacred covenants is then, in essence, a freewill, voluntary return of our agency to God. Ultimately, the only gift we can ever give to the Lord is our moral agency." "Moral agency expands endlessly when exercised righteously. Acting in doctrine yields protection and joy." "As we increase in learning, turn to the Savior, and act in doctrine, our personal testimonies of Him and of His gospel are strengthened and we become more fully converted." "Conversion is described in the scriptures as putting off the natural man, experiencing a mighty change of heart, undergoing a spiritual rebirth, and becoming a new creature in Christ." "Knowing by the power of the Holy Ghost that Jesus is the Christ is a good, an important, and a necessary thing. But earnestly coming unto Him and giving our whole souls as an offering requires much more than merely knowing." "We can begin preparing the hearts of our family members to be taught by telling the people we love that we love them...We simply should sincerely and frequently express love." Elder Maxwell's training: "Do not be afraid of repetitious teaching. Ask inspired questions. Typically, but not always, dialogue is better than one-way monologue." "As teachers, one of our most important responsibilities is to invite learners to act." "Our best efforts can only bring the message of truth UNTO the heart. Ultimately, a learner needs to act in righteousness and thereby invite the truth INTO his or her own heart." "The most important learnings of life are caught - not taught." "Gospel instructors should recognize that they do not teach lessons; they teach people... they invite seekers of truth to experience the mighty change of heart." I think that if you agree that a lot of the Apostles have particular themes that they like to hit on in their talks again and again, then there would be a good argument that Elder Bednar's theme is learning in faith. He has spent a lot of time talking about how to learn and how to teach gospel truths. This book is a follow up to his first "Increase in Learning" and seeks to answer the question that I have pondered many times: How does one effectively transform what we know into what we do? I thi I think that if you agree that a lot of the Apostles have particular themes that they like to hit on in their talks again and again, then there would be a good argument that Elder Bednar's theme is learning in faith. He has spent a lot of time talking about how to learn and how to teach gospel truths. This book is a follow up to his first "Increase in Learning" and seeks to answer the question that I have pondered many times: How does one effectively transform what we know into what we do? I think this is a quintessentially religious, and especially Christian, concern. In the Bible, followers of Christ are admonished to "take [the yoke of Christ] upon you, and learn of [Christ]" in order to "be ye therefore perfect, even as your Father which is in heaven is perfect." While the first may be in some ways easy, learning of the characteristics of Christ and his doctrines, applying them in our lives requires us to cast off our natural tendencies to align ourselves more with His will. This is, we believe, the work of more than a lifetime, but is also something that we have to strive for everyday. In this book, Elder Bednar outlines a few principles he feels will help us close the gap between what we know and what we do. There are several links to video segments of Elder Bednar with a group of people, as well as suggested further readings at the end of each segment. There are also questions and space (digitally and on paper) to write our own responses and thoughts as we think how we can improve and be more Christ-like. I liked this book for several reasons; it is short and acts more as a springboard to our own further study, as opposed to being the answer to all things. There is an interesting anecdote in the book in which a new member to the Church asks Elder Bednar a question, to which he declines to answer directly and instead points the questioner to scriptures where he would be able to find his own answer. The man was initially very disgruntled with the response, but did as he was advised and was able to find the answer for himself. I think this book is, in a lot of ways, the same. It is a starting point, but Elder Bednar, as he often talks about, leaves a lot of responsibility on the reader to study further and come to their own answers. With the new focus in study and teaching this book is a great asset. Elder Bednar sends you on a journey to discover the answers to your questions and to creating an environment to help others ask questions to discover for themselves the answers they may not even know they were seeking. This is a book that will be a companion to my study for years to come. With the new program of teaching this book and the DVD with it are amazing resources. Love it through and through. Elder David A. Bednar is a masterful teacher! In this newest book he teaches how we can become more Christlike and how agency really works. He also sets the pattern for effective teaching not only as teachers in church but as parents and even friendships. The enclosed DVD has Elder Bednar answering questions about his book. This book is definitely a MUST read! I love the the examples of the oil lamp and the oil, the jewel box and the pearl, and especially one I saw in my mind of turning from a mirror, where I focus on me, and turning towards a picture of the Savior. Reaching outward isn't always easy but Elder Bednar explains that we covenanted to do it. I have certainly refocused my priorities. Thank you Elder Bednar! So far I have read this book once and already got a lot out of it. However, this is a book that needs to be read, pondered, studied, etc, multiple times. This takes the true Gospel to a higher level of understanding. the dvd is also a great tool that comes with the book. Highly recommended! When I read this book, my experience was like this: "blah blah blah blah TOTAL GEM blah blah blah INSPIRING QUOTE blah blah." It gets a little boring at parts, but overall there's some great doctrine in this book. Get out of the way. You aren't the teacher. Become converted. Reach outward. This is another fantastic series of lessons by Elder Bednar. Another excellent book by Elder Bednar. He further builds upon and develops themes and foundational elements from the first book in this series (“Increase in Learning”). I highly recommend reading the series in the correct order for this reason. This book transitions from focusing on our spiritual learning (the central theme of the first book) to focusing on acting in accordance with our acquired knowledge. It is a natural-feeling progression, which is easy to both follow and understand. I found Another excellent book by Elder Bednar. He further builds upon and develops themes and foundational elements from the first book in this series (“Increase in Learning”). I highly recommend reading the series in the correct order for this reason. I found the links to clips from his Q&A session particularly enlightening and used several of those clips in Sunday School class I teach for one of the local Mormon congregations in my area. This is a fabulous addition to any personal scripture study regimen. Cannot day enough good things about it! Loved, loved, loved this book! Again I am so glad that I am reading this series of books that Bednar has put our now, as the COME FOLLOW ME program that started in 2019 and some of the other new changes of 2018 go right along with what is discussed in this book. The book is incomplete if you don’t read the talks he references at the end of each chapter and the icing on the cake is the DVD that comes with the book. So good!! I think I would’ve liked this book more if I had used it as study material. I guess I wasn’t prepared that that was its purpose. Obviously Elder Bednar is awesome, but if you aren’t diving into related material on your own it can get boring. It does contain the contents of the elusive MTC “Character of Christ” talk which is nice. This book teaches the importance of obtaining the character of Christ through conversion to his doctrine. It also has key guidance on the effectiveness of converted gospel service and teaching done in the Savior's way. The video clips, and note sections make this a workshop vs a book. I recommend it. Excellent insights into the doctrine of Christ! So much to learn from these teachings. Elder Bednar teaches in a way that is easy to understand and so applicable to everyone! I love this book! I loved this even more than I loved Increase In Learning!! It makes me excited to start the third one! It only got better!! More a workbook than anything. As the title say “Act”, doing something about it, it becomes part of you. Excellent, excellent book! Highly recommend for applying Gospel doctrines into our daily lives. Worthwhile if you read and use as a workbook to document progress and learning. This is another wonderful book by Elder Bednar inspiring action! This is not a book to just read, but to ponder and live and apply and practice and learn for ourselves. It comes with a neat DVD of a discussion with individuals asking Elder Bednar questions about how to best apply the principles and doctrine in their lives. There are some very profound, humble and sweet questions asked, and so much to learn about the pattern of learning and living the gospel and the doctrine of Christ. Learning a This is another wonderful book by Elder Bednar inspiring action! This is not a book to just read, but to ponder and live and apply and practice and learn for ourselves. It comes with a neat DVD of a discussion with individuals asking Elder Bednar questions about how to best apply the principles and doctrine in their lives. There are some very profound, humble and sweet questions asked, and so much to learn about the pattern of learning and living the gospel and the doctrine of Christ. We must understand the character of Christ and strive to develop Christlike character in our own lives - most importantly forgetting ourselves and looking outward to serve and love others, just as the Savior would. As we understand God's plan, His teachings, agency and covenants we will desire to give our agency or will to God to follow Him more fully. Conversion is more than testimony - it is living what we know to be true. Once we know something we desire to teach and share it. We teach most effectively when we invite others to learn for themselves by the Holy Ghost. "A testimony alone is not and will not be enough to protect us in the latter-day storm of evil and religious persecution in which we do now and will yet live (p. 80)." "Whereas a testimony is spiritual knowledge of truth obtained through the power of the Holy Ghost, conversion is deepening devotion to and consistent application of the knowledge we have received. Knowing that the gospel is true is the essence of testimony. Consistently being true to the gospel we know is the essence of conversion (p. 83)." "An answer we discover or obtain through the exercise of faith is typically retained for a lifetime. The most important learnings of life are caught--not taught. The spiritual understanding you and I have been blessed to receive, and which has been confirmed as true in our hearts, simply cannot be given to another person. The tuition of diligence and learning by faith must be paid to obtain and personally 'own' such knowledge. Only in this way can what is known in the mind be transformed into what is felt in the heart. Only in this way can a person move beyond relying upon the spiritual knowledge and experience of others and claim those blessings for himself or herself. Only in this way can we be spiritually prepared for what is coming (p. 127)." "This work is never about me and it is never about you. We need to do all in our power to fulfill our teaching responsibilities and simultaneously 'get out of the way' so the Holy Ghost can perform His sacred work. In fact, anything that you or I do as representatives of the Savior that knowingly and intentionally draws attention to self--in the message we present, in the methods we use, or in our personal demeanor--is a form of priestcraft that inhibits the teaching effectiveness of the Holy Ghost (p. 131)." Elder Bendar gives references to several of his talks for further study, as well as many insightful scriptural and personal examples to consider. I love that this book invites and demands different things of each of us in our own personal spiritual preparation. This book and the accompanying DVD are life-changing as we will apply the patterns and teachings in our lives and act on the individual promptings we receive to continue to learn, turn outward and to the Lord, and ACT in the doctrine we receive. To begin with I would like to say that the accompanying DVD that goes with this book is quite excellent. Watching and listening to Elder Bednar simply answer questions by many times asking a question or guiding the questioner where to find the answer him or herself left me with a desire to hold question-and-answer sessions more often with my children. I absolutely loved Elder Bednar's book "Increase in Learning" and really dove in, writing in the margins, keeping a notebook handy and writing my o To begin with I would like to say that the accompanying DVD that goes with this book is quite excellent. Watching and listening to Elder Bednar simply answer questions by many times asking a question or guiding the questioner where to find the answer him or herself left me with a desire to hold question-and-answer sessions more often with my children. I absolutely loved Elder Bednar's book "Increase in Learning" and really dove in, writing in the margins, keeping a notebook handy and writing my own questions and answers to questions posed in the book. This book has much the same format but includes blank pages at the end of each chapter with space to write. Some may feel that this is a waste of space, but I love it - I am able to record my thoughts and impressions in the book and keep it as a treasure. Personally I was most inspired by chapter 1: Acting in Doctrine and the Character of Christ. Early in the chapter he writes: "As disciples of the Savior, we are not merely striving to know more; rather, we need to consistently do more of what we know is right and become better. 'If ye know these things, happy are ye if ye do them' (John 13:17)." Elder Bednar then goes on to write about the definition of character and the importance of understanding the true character of the Savior. Many examples were then given of the Savior and others, who, while experiencing difficulty themselves, took the time to reach out to others who were experiencing trials. So, my goals or stated beliefs are one thing, but my actions indicate something different. How to bring these things into alignment? With this premise/question, (Elder) David Bednar, one of 12 apostles in the Church of Jesus Christ of Latter-Day Saints, sets out to suggest what the reader needs to do in order to resolve this conflict. This is the 2nd in a series of books, beginning with Increase in Learning, this book, and then Power to Become. The book is not considered 'official church doctrin So, my goals or stated beliefs are one thing, but my actions indicate something different. How to bring these things into alignment? With this premise/question, (Elder) David Bednar, one of 12 apostles in the Church of Jesus Christ of Latter-Day Saints, sets out to suggest what the reader needs to do in order to resolve this conflict. This is the 2nd in a series of books, beginning with Increase in Learning, this book, and then Power to Become. The book is not considered 'official church doctrine'. The book does come with a DVD containing the results of a Q&A session held with early readers of the book and it is referenced in the sidebar of the chapters. After reading some of these other reviews, I'm thinking that maybe for this to be a five star book, one needs to actually buy it, use it as the study guide and notebook that Elder Bednar intends it to be. There are lots of questions asked and lots of space to write your thoughts and answers. Give this book the time and thought it deserves. Watch the accompanying DVD. I did none of those things. I read it as quickly as I could, in two or three days actually, before I had to return it to the librar After reading some of these other reviews, I'm thinking that maybe for this to be a five star book, one needs to actually buy it, use it as the study guide and notebook that Elder Bednar intends it to be. There are lots of questions asked and lots of space to write your thoughts and answers. Give this book the time and thought it deserves. Watch the accompanying DVD. I did none of those things. I read it as quickly as I could, in two or three days actually, before I had to return it to the library. I can't help but feel a little bad that I read this book exactly NOT the way the author would have liked. :o) Prepare yourself to have some pondering and journaling time with this book, and maybe you will enjoy it more than I did. There were things that I appreciated here. It had more of personal examples to illustrate what was being taught, and I like that. This book was shorter, because the "related readings" (conference talks, a couple were from BYU devotionals) at the end of the chapters were referenced, not printed in their entirety. As with Increase in Learning, my favorite chapter was the last. It was on how acting in doctrine relates to and can enhance our ability to teach. Applicable to me right now in my Sunday School calling and as a parent. I do wish I had taken down a few notes. Some good, solid discussion about how to better align what we know to be true with how we act. "Elder Dallin H. Oaks has explained that in renewing our baptismal covenants by partaking of the emblems of the sacrament, “we do not witness that we take upon us the name of Jesus Christ. [Rather, we] witness that we are willing to do so. (See D&C 20:77.) The fact that we only witness to our willingness suggests that something else must happen before we actually take that sacred name upon us in the Some good, solid discussion about how to better align what we know to be true with how we act. "Elder Dallin H. Oaks has explained that in renewing our baptismal covenants by partaking of the emblems of the sacrament, “we do not witness that we take upon us the name of Jesus Christ. [Rather, we] witness that we are willing to do so. (See D&C 20:77.) The fact that we only witness to our willingness suggests that something else must happen before we actually take that sacred name upon us in the [ultimate and] most important sense” (“Taking upon Us the Name of Jesus Christ,” 81). The baptismal covenant clearly contemplates a future event or events and looks forward to the temple." "Indeed, believing that another person offended us is fundamentally false. To be offended is a choice we make; it is not a condition inflicted or imposed upon us by someone or something else." "Selfishness always leads to shallow satisfaction and sorrow and renders unattainable the deepest yearnings of the soul." "In fact, anything you or I do as representatives of the Savior that knowingly and intentionally draws attention to self—in the messages we present, in the methods we use, or in our personal demeanor—is a form of priestcraft that inhibits the teaching effectiveness of the Holy Ghost." First of all...if you haven't read his book Increase in Learning it is an absolute must read for any Latter Day Saint. There is one key idea in this book that has surfaced in my mind everyday since I read it, the idea of which way we are turned. I recommend reading it on Deseret Bookshelf (app) so that you have instant access to the videos, which are incredibly insightful. This is the second of a three book series, fairly short. I have not read the first book but he gives an overview of it in this book. The third book just came out. The first book was about how we come to KNOW what we should do. This book is about applying that knowledge into ACTION. The third is about how those actions help us BECOME like Jesus. The best part of this book are the links to videos of a Q&A session he held with a group of people who read an advanced copy of the book. We see him i This is the second of a three book series, fairly short. I have not read the first book but he gives an overview of it in this book. The third book just came out. The first book was about how we come to KNOW what we should do. This book is about applying that knowledge into ACTION. The third is about how those actions help us BECOME like Jesus. The best part of this book are the links to videos of a Q&A session he held with a group of people who read an advanced copy of the book. We see him interacting with adults and children discussing their needs. Among the advantages of this is that we not only hear him talk about teaching (as in chapter 4) but we see him doing it as an example. I've used those videos in family home evening and in my Church teaching. Update: March 2016-This was my pick for our Book Club this year. I enjoyed reading this so much, that I couldn't wait to have a discussion with my "Book Club" ladies. It was even better the second time through. I really need to purchase this book. Read in January 2015: While I was reading the first book, I discovered that Elder Bednar has been talking about this same topic for a long, long time, even before he became a member of the Quorum of the Twelve Apostles in the Church of Jesus Christ of Update: March 2016-This was my pick for our Book Club this year. I enjoyed reading this so much, that I couldn't wait to have a discussion with my "Book Club" ladies. It was even better the second time through. I really need to purchase this book. This book is really good. I requires a quiet corner, and a highlighter. There is an area on each page for your own personal notes. I used my area for thoughts that would pop on my head as I was reading. Questions for myself usually. The accompanying DVD is a great idea. If you are reading the book as an e-read it is perfect. You are reading along and the video that correlates to the subject is right there. You push play and there you go. If you are reading the hard back version you just insert th This book is really good. I requires a quiet corner, and a highlighter. There is an area on each page for your own personal notes. I used my area for thoughts that would pop on my head as I was reading. Questions for myself usually. The accompanying DVD is a great idea. If you are reading the book as an e-read it is perfect. You are reading along and the video that correlates to the subject is right there. You push play and there you go. If you are reading the hard back version you just insert the DVD. I cheated I bought both versions, and would just push play on my tablet when I was at a video, and my notes are all over in the hard version. David A. Bednar was ordained and set apart as a member of the Quorum of the Twelve Apostles of The Church of Jesus Christ of Latter-day Saints on October 7, 2004. Bednar was born on 15 June 1952, in Oakland, California. His mother came from a long line of Latter-day Saints, but Bednar's father did not join the church until Bednar was in his late twenties. He served as a full-time missionary in Sou David A. Bednar was ordained and set apart as a member of the Quorum of the Twelve Apostles of The Church of Jesus Christ of Latter-day Saints on October 7, 2004. Bednar was born on 15 June 1952, in Oakland, California. His mother came from a long line of Latter-day Saints, but Bednar's father did not join the church until Bednar was in his late twenties. He served as a full-time missionary in Southern Germany and then attended Brigham Young University, where he received a Bachelor of Arts degree in communication in 1976 and a Master of Arts degree in organizational communication in 1977. He then received a Doctorate in organizational behavior from Purdue University in 1980. From 1980 to 1984, Bednar was the assistant professor of management in the Sam M. Walton College of Business (then College of Business Administration) at the University of Arkansas in Fayetteville, Arkansas. He became assistant professor of management at Texas Tech University from 1984 to 1986. He then moved back to the University of Arkansas as the Associate Dean for Graduate Studies in the Sam M. Walton College of Business from 1987 to 1992 and was then the director of the Management Decision-Making Lab from 1992 to 1997. In 1994, he was recognized as the outstanding teacher at the University of Arkansas and received the Burlington Northern Foundation Award for Excellence in Teaching. He has twice been the recipient of the Outstanding Teacher Award in the College of Business Administration. Bednar then served as the president of Ricks College/Brigham Young University–Idaho from 1997 to 2004 in Rexburg, Idaho. There, he oversaw and managed the transition of the school from, what was at the time, the largest private junior college in the United States, Ricks College, to a four year university, Brigham Young University-Idaho. Bednar married Susan Kae Robinson in the Salt Lake Temple on 20 March 1975. They are the parents of three sons. His publications have appeared in Labor and Industrial Relations Review, Academy of Management Review, Human Relations, Quality Progress, Quality Management Journal, Cornell Research Quarterly, National Productivity Review, The Journal of Retail Banking Services, The Journal of Business Communication, The Journal of Business Education, and other journals.